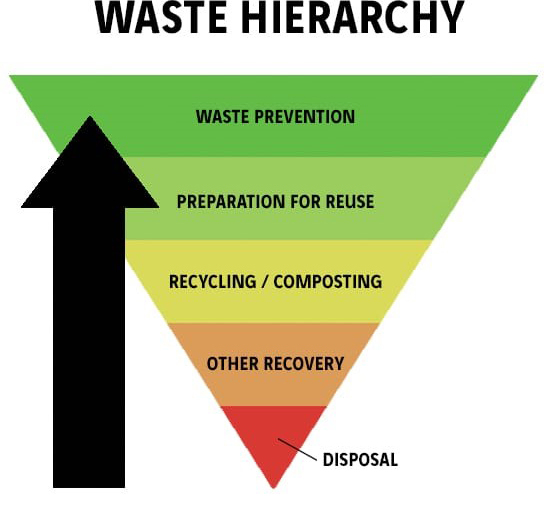 M W White adheres to the waste hierarchy; ensuring that sustainable solutions are provided; that waste costs for your business are reduced and that reliance on landfill site usage is lowered. Prevention: Pro-actively working to prevent waste, in the first instance, helps to reduce reliance on all other stages of the hierarchy. If the reduction process can be maximised, it will vastly reduce the extent of the remaining steps in the hierarchy. This not only cuts down the amount of waste going to landfill but cuts on the number of products being produced, saving manufacturing energy in the process. However, regardless of your business, there is always going to be an element of waste in one form or another. Reuse: Reusing products for their primary intended purpose, immediately reduces impact on waste. This often this requires a cleaning, repairing or refurbishing job to ensure the item is safe for reuse. However, in some instances – with a bit of forward thinking and conscientious effort – it doesn’t necessarily need to be a complex step; it could be as simple as using both sides of a sheet of paper before disposal/recycling. Recycling: Collecting waste items and processing them into raw materials – allowing remanufacture into usable products and materials – immediately reduces a sum of prospective landfill content. Whilst a lot of businesses are already coherent and engaged with this step, whether that be by personal choice or legal requirement, there remains a mass of opportunity for all business to reduce their environmental impact by further embracing recycling. Recovery: Recovering energy from waste materials is oft overlooked and not necessarily considered, at many business levels. The recovery of materials involves recycling, composting and similar activities. Harvesting the recovery of energy, via incineration or by using a biomass boiler for instance, is just one more way of getting the most out of waste, otherwise destined for landfill. Disposal: When reuse, recycling and recovering has all been conducted, there is little option left for waste, other than disposal. The aim here is for the previous steps to have been followed and for as little waste as possible to reach this point, as this involves disposing of the waste in landfill or incinerating the waste in a plant without extraction of any useful energy.